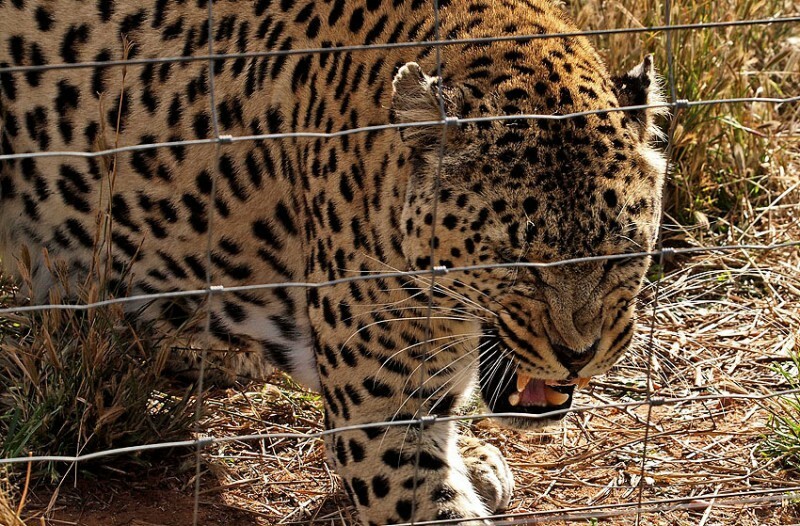 Our first stop on the “feeding tour” was with the Leopard. We had been cuddling another spotted cat just a few hours earlier – so what is the difference? The cheetah can be 85 cm in shoulder height. 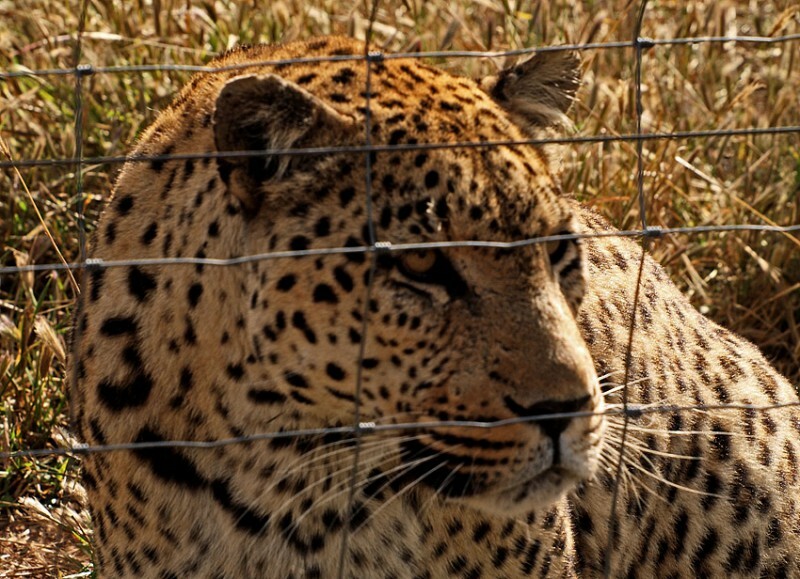 The leopard is only 65 cm. Small cat! But the cheetah male weighs 40-60 kg whereas the leopard can weigh up to 80 kg. When we came to the fence it was immediately clear to all of us that this is another kind of animal. The cheetah uses fantastic speed to hunt. The leopard has another kind of strength. The cheetah quickly eats what it can after the kill. The leopard hauls it’s prey up in a tree. 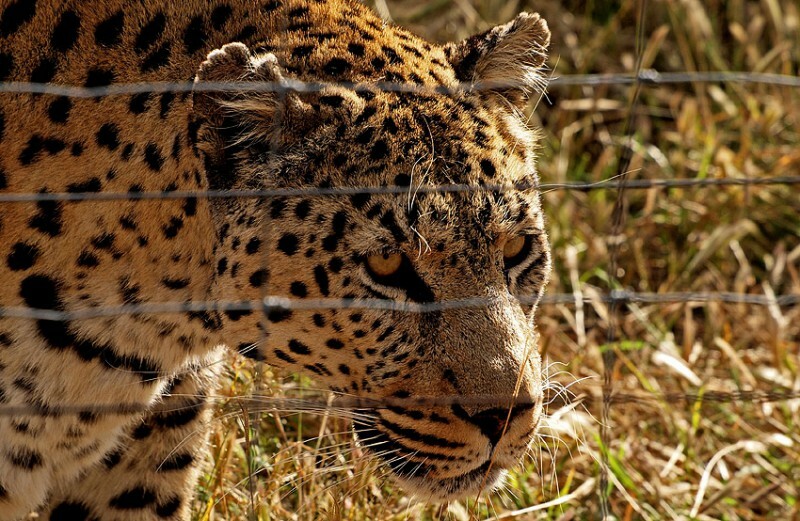 A leopard is strong enough to haul even big antelopes – weighing twice as much as the leopard it self. It can eat it’s prey for several days – even after the meat has started to rotten. In a book I have it says that the leopard has got “keen senses and is very cunning and dangerous”. Even if we were safe outside the fence it was quite obvious that this is a dangerous cat. Our guide put it like this – he would rather meet a lion than a leopard. He said that you might convince a lion not to attack – by looking it into the eyes, stand firm and tall and perhaps yell out loud. But that will never work with a leopard.